It’s time for the latest Quirky Crafts Challenge. This week the theme is rainbow colours. As you may have noticed, I love colour… so this was a great opportunity to cram every colour into one piece! One thing that I promised myself I’d do, as part of the Quirky Crafts Design Team, is to think outside the box with regards to what I make. Rather than creating things like cards and tags (which the rest of the team are truly excellent at) I try to be a little more random. This is purely because I have perfectionism issues, I constantly compare my art to other people’s and the only way I can avoid this is to do something noone else would. 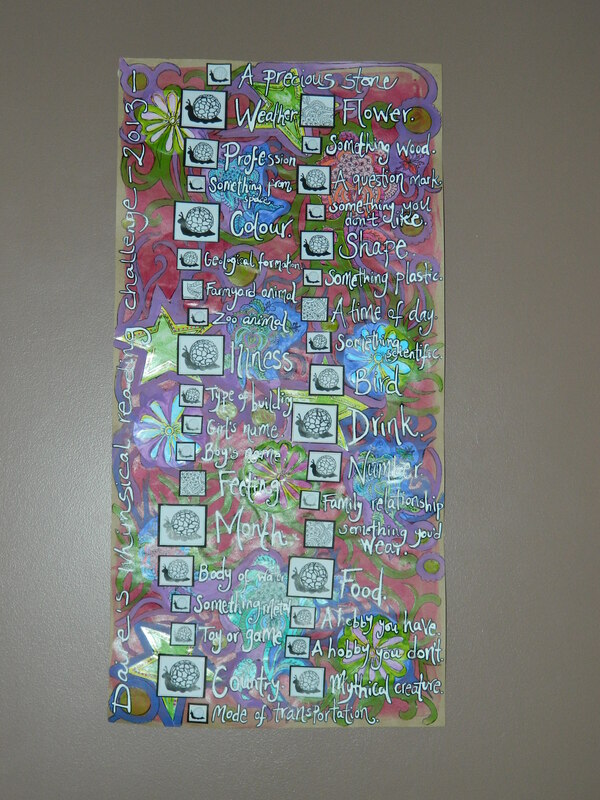 So for this challenge I decided to make a big check list for my whimsical reading challenge using the ‘I’m so busy’ and ‘Stained Glass Snail’ digi stamps from Stitchy Bear. What do you think? Rainbow coloured enough? I’ll be back later in the week with a ‘step-by-step’ of how I made this poster! Don’t forget to hop over and take part in this most recent QC Challenge. Headline prompt: Radical to Mundane and to Radical Again: What once seemed new that now feels old and boring? How can you see it as new again? How do you “jump charge” creativity when you’re feeling stuck? 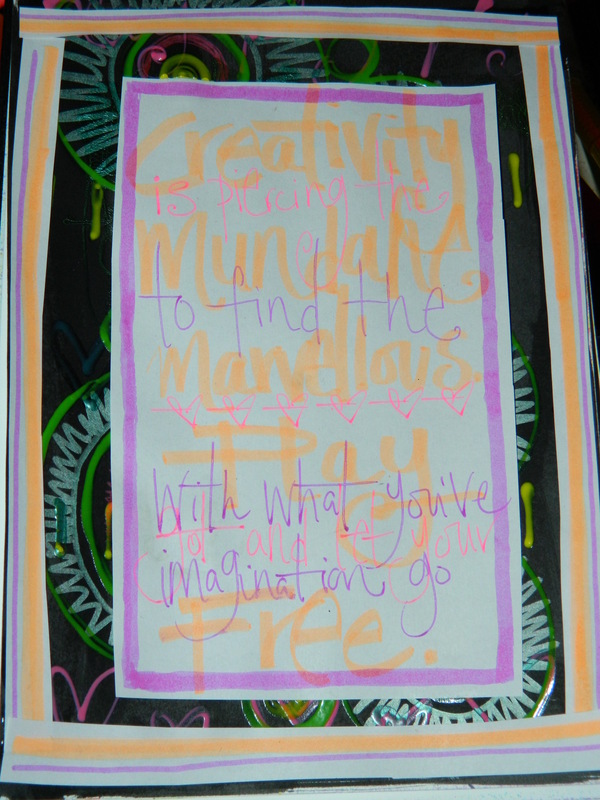 The text is a combination of the Bill Moyers quote and my response to the question ‘how do you jump charge creativity when you’re feeling stuck’ (Play with what you’ve got and let your imagination go free). And I really try some new things with this page, painting the background with india ink and trying out my new dimensional paint. I don’t adore the results, but I’m not a huge fan of neon anyway… it was fun though! Every single one of the stamps used on this page was homemade: the flowers, the feathers, the face shape, the spiral… all of them! Stamping is one of my fave things in the world, so I had a lot of fun with this one! 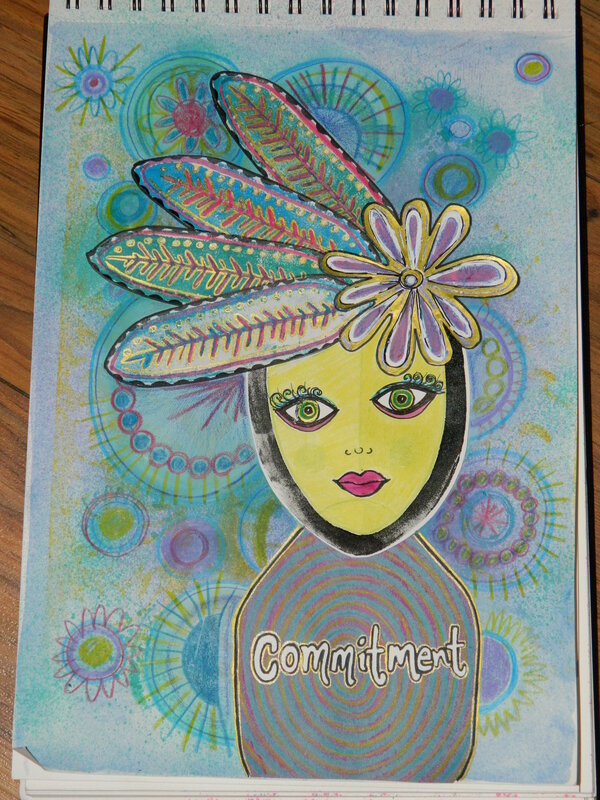 The ‘true intention’ I chose to represent what I’ll be working on this year is commitment. I’ve always been fiercely independent, so committing to another person does not come easy. That is something I’d like to try to change over the next year; I want to be able to trust another person as much as I trust myself! 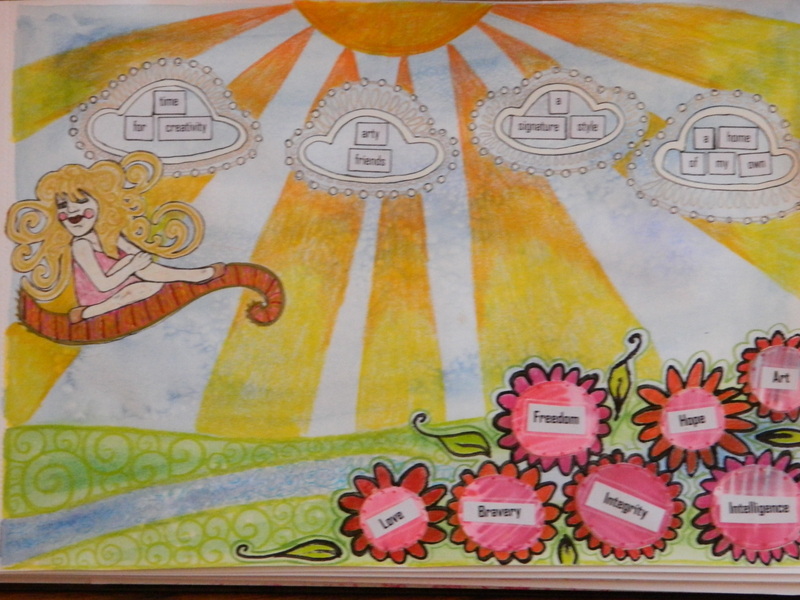 I used a mixture of paints, pencils and pens on this page, I just picked up whatever was nearest at the time. I guess that’s the fun part, right? I wouldn’t describe this as a ‘work of art’ but I enjoyed making it, and I’ll probably use the techniques again. My favourite bit of the whole page is probably the headdress… I love the detail and the colours… what’s your favourite thing about this page? 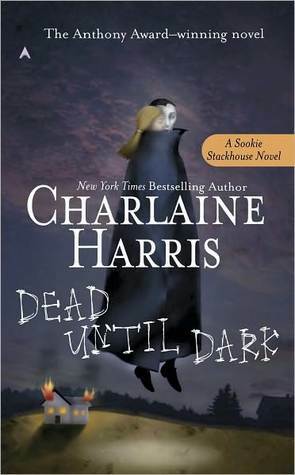 Dead until Dark by Charlaine Harris is the first book I read this year. If I’m honest, I’ve been putting off reading this particular book for quite a while. Why? Because I love True Blood… so I knew that the book would either be total rubbish and kill the TV show for me, or be so amazing that the TV show couldn’t live up to it. Luckily for my viewing habits, I was wrong on both counts. It was nice, easy reading… a bit of a break from all the looong Victorian novels I’ve been working on. I wouldn’t describe it as the most spectacular prose I’ve ever encountered but I still found it enjoyable. P.S. I’ve recently signed up with goodreads in order to keep track of my TBR pile/current reading goals – check out my progress on the right hand side of this page. Apologies for my absence, I’ve been locked in a world of critical essays and Harvard referencing for the past few days, but now I’m back! Today I’m going to share a few more suggestions for my Whimsical Reading Challenge, this time on the topic of ‘colour’. This is my next set book for AA316, my current Open University course. Apparently it’s quite Gothic and scandalous so it should be a good read, plus it comes highly recommended by my Grandma! ON MY TO BE READ PILE. This is a retelling of the story of Dinah, a barely hinted at character from the Book of Genesis. I think reinterpreting bible stories can be a bit of a hazardous way to go, as some people can get a bit sensitive… but I’m fascinated by the historical aspects so hopefully I won’t be disappointed. ON MY TO BE READ PILE. I think James Patterson is a genius (as should any diehard fan of crime fiction) but I’ve never got round to reading either of these. I can usually get through one of his novels in about a day, so if I get a weekend to myself in the near future I might treat myself! I will not apologise for loving Maeve Binchy, it just comes naturally. I have read and reread this book so many times that I feel like I know all of her characters. You will laugh, you will (try not to) cry and you’ll do both all over again. To me that’s the sign of a great book, the willingness to put yourself through it all over again! ON MY TO BE READ PILE. (For those of you who do not paint, ‘rose madder’ is a shade of pink.) I’ve never read a thing by Stephen King, but somehow I’ve ended up with a complete collection staring down at me from the shelves. He’s not on the top of my reading list right now, but the day will definitely come! So tell me, have you come up with any ideas for your ‘colour’ inspired reading? On top of my watercolour background I used a selection of pens, pencils and collage pieces to create each element of my page. My transport of choice was the flying carpet (the only way for a girl to travel) and the figure was made of a photo of me stuck onto the body of a magazine body. This is something I NEVER do in my artwork: using photos of myself. To stop it from looking too much like me I covered the whole thing in correction fluid and embellished with different pens and markers. The only bits I left untouched were the shoes and the lips. Each element of the page looked far too isolated, so I added an all-encompassing sun to unit each of the images (and this could also be something more symbolic if you wanted it too, but for me it just makes the page stick together more). I really enjoyed the process of creating this spread, despite it being a far cry from what I would usually do AND having a very ‘un-me’ colour palette. I think the lesson learned from doing an exercise like this is that it’s ok to be a planner and look forward, but just don’t forget all the things you already have. 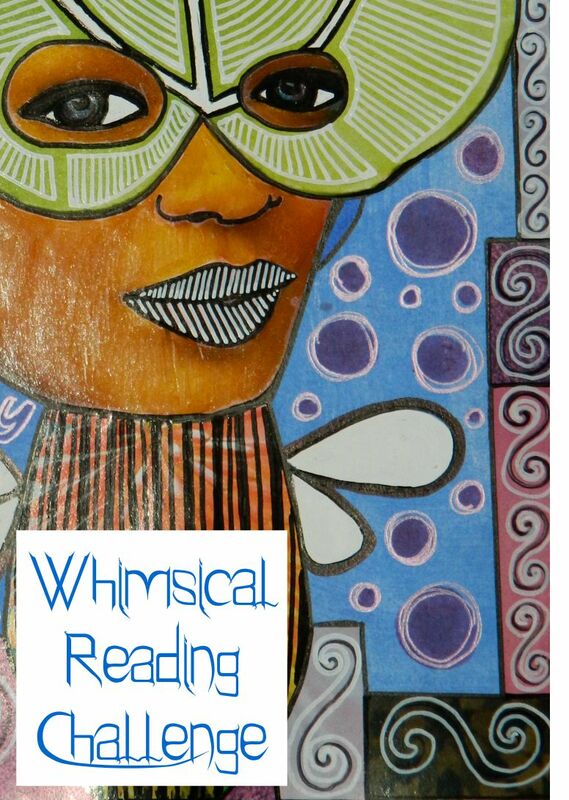 Last week I welcomed you to join me on whimsical reading challenge, which involves choosing books based on the words in their titles. It has since been brought to my attention that it may be a bit on the tricky side for those of us who don’t have an extensive library in their living room. So to help you along, I thought I’d write a post each week with a few ideas of books you could pick. I’m going to try and spread my wings quite far with regards to genre, but these will still all be books I have read, or have on my shelves. If I can actually come up five books for each of these categories, I’ll be amazed! This is one of Maeve Binchy’s more recent novels, and is one of the few not set in or around Dublin. She has the true gift of a story teller and starting one of her books is like being given a huge cup of tea and a big hug. ON MY ‘TO BE READ’ PILE – the turquoise cover is what originally attracted me to this book, but I think I might actually enjoy reading this Scandinavian crime drama as well as looking at it. Probably one of my favourite books of my teenage years (but probably not intended for teenage girls). Set in the midst of the Vietnam War in a teeny American town, this tells the story of a group of friends who have to deal with a murder of someone they know. A truly excellent book. I might have to crack it out again for a reread! ON MY ‘TO BE READ’ PILE – I watched the film (partially because of the George Clooney thing) but I didn’t really like it. I’m a fan of the happy ending and I’m not ashamed to admit it. However, I bought the book as part of a set (I like buying full sets of things, they fool me into thinking my bookshelves are organised), and I have been told ye a fellow reader that the prose is beautiful, so for now it will remain on my TBR pile. Number four in the Anne of Green Gables series and doesn’t disappoint. I adored these when I was little, and I ADORED the mini-series (which I think was made in the late eighties), so much so that I begged my mum to dye my hair ginger. Unfortunately, she refused. If you can think of any more, or fancy joining in with me, leave a comment below!